Whilst I’m of the opinion that green things are generally good, like saving energy, there are some things that really don’t make much sense to me. On 31 March 2007, 2.2 million people and 2100 Sydney businesses turned off their lights for one hour – Earth Hour. This massive collective effort reduced Sydney’s energy consumption by 10.2% for one hour, which is the equivalent effect of taking 48,000 cars off the road for a year. The turn-off time was from 8pm-9pm. So presumably all of these businesses and cities agreed to turn off the lights, because it would not effect public safety, in the case of city infrastructure, and would not impact on a businesses income as their workers would not be working. 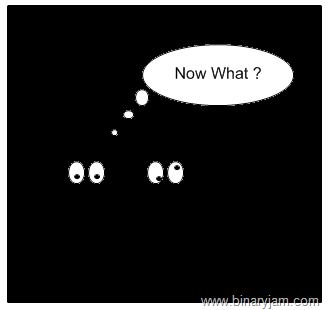 I have no doubt that the participants are not like the two in my cartoon and for that day the lights went out and no-one was there to notice. Which you would most likely find is the case 365 days of the year. So why one day people? If you can turn the lights out that day, then chances are you can turn them of every damn day and save yourself money by doing so. Cities should make the conversion to new LED lighting where ever possible, save our money on bills and lower light pollution as these can be more directed. There are other one day actions like this. In the UK we recently had e-day another wonderfully ludicrous concept this time leaving everything off. Well If I don’t need it and unlike my T.V. is designed to be turned off, then turned off it gets. Just cos its e-day, what, am I not supposed to cook my dinner ? Or not doing the washing, all you do is postpone the usage to the next next. This stupidity resulted in a gain in electricity usage that day due to inclement weather. Ha. So a message to these people one day actions are good to raise awareness but don’t sell them as that, have one-day actions that are pitched at modifying behavior permanently and sell them as that. Otherwise participants really are just sat in the dark waiting for the chimes to ring to turn the juice back on. On the upside, there are long term things you could look at. Powerdown device – Shut down those monitors and printers eating your cash. Electrisave – Monitor your usage. There are lots of energy savings devices out there only you really know if they will work for you, I have an eco-kettle and it lasted a week before switching back to a normal kettle, we donated it to local school, it didn’t work for us. Just contact your leccy supplier and whoever it is will have some kind of energy savings pack, or fill in an energy savings report and some will send you free stuff. I haven’t paid for a single lightbulb and kitted out the whole house filling in forms and talking to supplier got em all free. To be honest all this ‘green’ stuff is just crap. I purposely bought a car this time round that is not ‘green’ just because I can! I’m all for saving money, but believe me the silly rubbish like this won’t save the planet….